Monday morning. Everyone else in San Francisco is struggling to get to work. Not me and the wife, however. Because we are unemployed. At least til Wednesday, when I start my next gig. For now, we are drinking our blues and financial woes away with a 48 hour Tiki adventure. We had arrived in town just yesterday and killed off the night with 4 stops outside of San Fran: Forbidden Island, Longitude, a closed Trader Vics and the cozy Kona Club. You can read about it here. Now, hung over and breakfasted, we took a “hop on/hop off” bus around town – probably the best way to see “where little cable cars climb halfway to the stars” in a short amount of time. After accidentally stumbling upon the best pizza in town, Haight-Ashbury’s Escape From New York Pizza (big slices of deliciousness, seemingly invented to blast out any sized hangover, and it does the trick) we zipped back to our hotel to start the San Francisco portion of our two night tiki crawl. 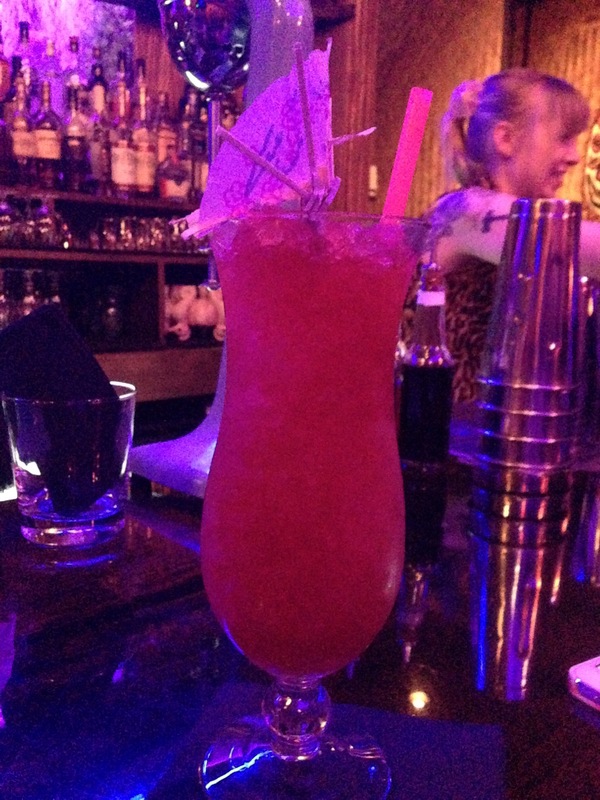 Tonight’s adventures should’ve included hitting three more tiki bars. 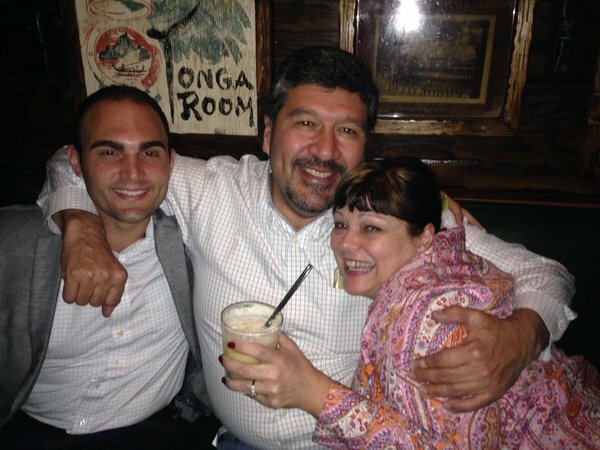 But horrors – upon investigating we found that Tonga Room at the top of the Fairmont Hotel – probably the Bay Area’s most famous tiki bar – is closed Mondays. This is what comes of traveling first – and asking questions later. Oh well, we cross one off, and set our sights on the joints that look at Mondays as if they were just another Saturday night. 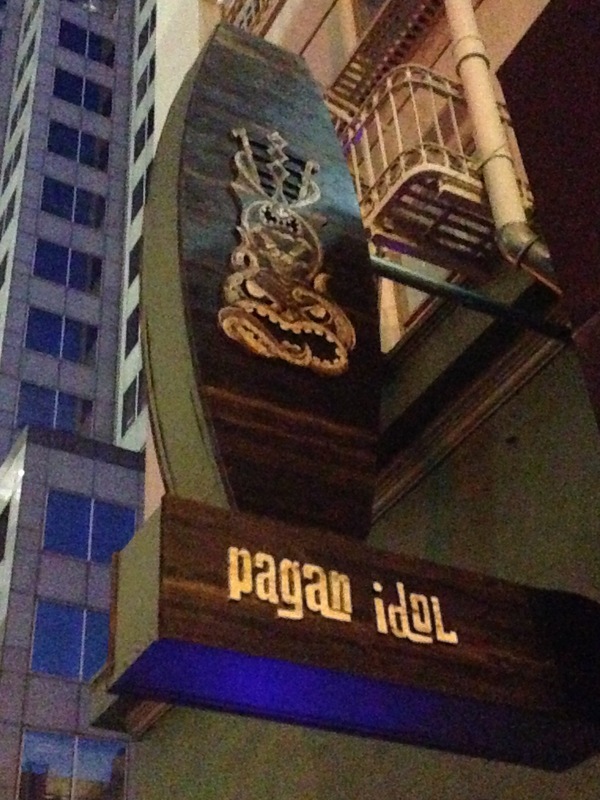 While we went full-tilt tiki with our attire yesterday, we choose to play it a little low key tonight, mostly because our first stop, the newly opened Pagan Idol, is rumored to cater to so many hipsters that they’re falling out of the joint. And we don’t want to stick out like Palm Springs seniors. And boy, did we nail it. We walk in just when they open at 5 o’clock after scoring the most insane Doris Day parking right out front. Inside, our eyes fall out of our designated sockets. It’s literally like walking into the lower decks of a ship’s hull (named “Captain’s Quarters,” they deliver on the promise). A long lower bar, stretched down one side of the room, opposite a wall of video portals of fish swimming about, is almost reminiscent of Disneyland’s Submarine Ride. If this room was the entire bar, it couldn’t do better. But far up ahead, we spy some red, almost simmering stairs that lead to the main antechamber. 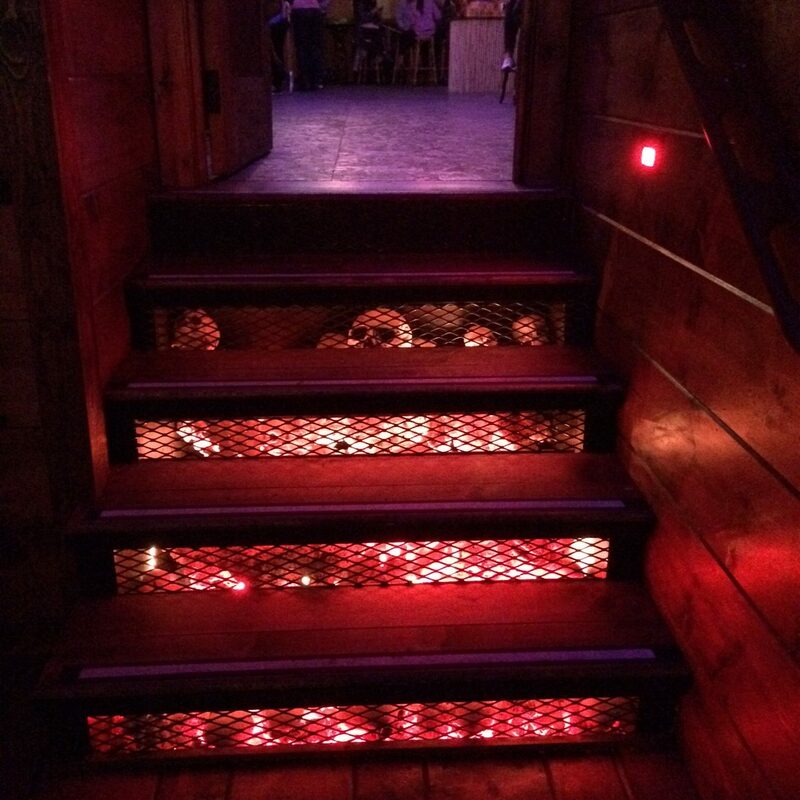 As we approach, we are shocked to find the simmering effect is actually a pile of red lit skulls, buried underneath the steps. 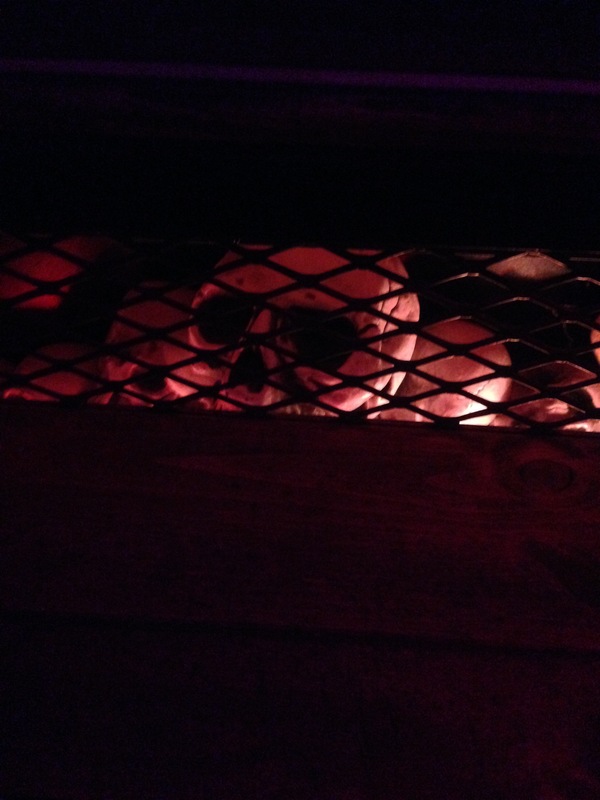 Now we’re entering Pirates of the Caribbean territory, and we can barely contain our glee. The next room is decked out in a more standard tiki design; blowfish lamps and thatched hut roofing. Continue on and there are other rooms, one with a very colorful exotic village night scene complete with bubbling volcano, and starry skies that continue to remind one of the Blue Bayou restaurant situated at the mouth of the Pirates ride. Along the wall are tiny thatched huts where different groups and couples can attain serious privacy. We belly up to the bar and try to make our order, but even though the place is relatively quiet, the two bar-tendresses, (is that a word? My spellcheck seems to think so) are purposely ignoring us. Then, as if on cue, it seems the 9-5 bus lets out and the place becomes inundated (not with hipsters at all – but instead) the 20something, nightclub going work force, that should be heading to Club Selfie rather than a tiki bar. But since Pagan Idol just opened, it’s still going through the “so cool, so new” period, that even if it were a “BJ and the Bear” themed bar, these “kids”, would come a-flocking. Now it was even more difficult to get the attention of the too-cool-for-you “mixologists,” and as cackling, bumping and boasting Millenials crowded around us, the wife waved a menu in the air as if swatting flies, and we were able to place our first order of the night. 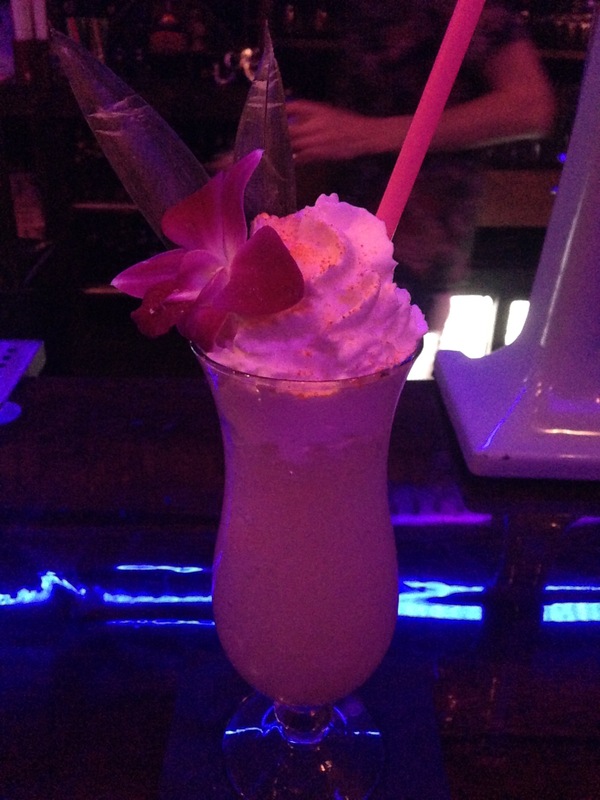 I chose one of their specialties; The Bird of Paradise – a mix of cachaca, Tequila, passion fruit and vanilla, all whipped up like a milk shake with a liberal gob of whipped cream on top with an orchid and some cinnamon to boot. The wife’s first drink was a wise choice; the City of Refuge, which she later claims could be her favorite drink of the whole trip: Pisco (a very hot Peruvian liqueur right now – Someday we’ll give you the ingredients to Javier Fuentes’ Pisco Sour, the most delicious South American Cocktail; bar-none), Silver Rum, Yellow Chartreuse, lavender, citrus oil, lemon, hibiscus cordial and finally – roses – cause, why not? 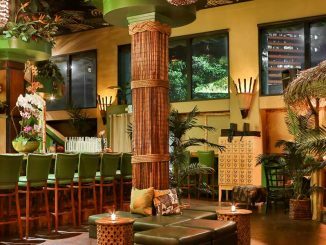 Our two drinks seemed to be indicative of Pagan Idol’s Mixology style; very unusual, atypical tiki fare, loaded with ingredients, highlighting floral and fragrant drinks that are sweeping the country right now. Bitters may have been so hip in 2015, but in 2016, floral is the new black. The wife scoped out a recently vacated hut that we pounced on with perhaps a little too much verve. 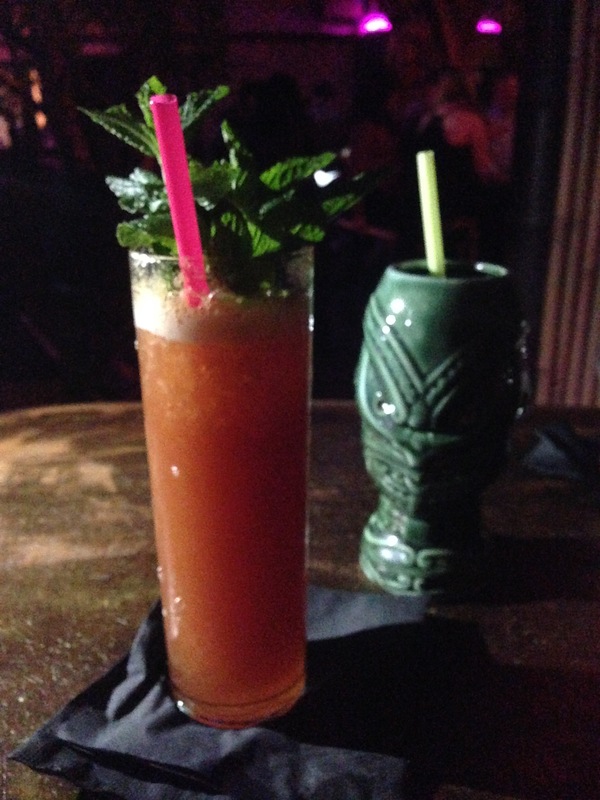 In fact, before a server could clean up, the detritus of the last patrons gave us a great opportunity to check out Pagan Idol’s tiki mug, which as you know if you read part one, was our premeditated souvenir grab for each bar. If we had been true pirates, we would have pocketed the tiki mug left behind, still half full of a drink, but we wanted to donate evenly to all the tiki bars, so the only evidence we took was a quick snapshot before the waiter cleared our table. And of course, we ended up buying one as well. We learned from our (nicer than the bartenders) server that Pagan Idol was the perfect replacement for Tonga Room, since head bartenders Jack Dale and William Preston (neither of whom were there that night) were transplants from Tonga Room, and so took with them the joie de vivre and experiences they gleaned from that well-heeled establishment. After finishing these two exquisite samples of the fine bar menu, and with the helpful suggestion of our server, we decided to split our third drink; the Daywalker. A potent mix of Puerto Rican, Jamaican and Overproof rums, orange, pineapple, lemon and grenadine juices and syrups, the real end kickers here are a smidge of absinthe (Hello Green Fairy!) and fassionola, one of many “extinct syrups” that Pagan Idol has impressively “resurrected,” something that really gives this new place the promise of staying power. Legend has it that Fassionola was a Tropical Gold (“red colored”) fruit mix, used as the basis of most tiki drinks from back in the 1920s. Well, that and the absinthe give this drink it’s deep, dark exotic taste, and I’ll tell you – it’s hallucinogenic properties became my mistress for the rest of the evening. We flew (I swear, we soared through the skies on the back of that damned green fairy) to a very nondescript neighborhood, driving past our next location several times without ever seeing it. Our Uber driver finally promised us THIS was the place, and we were left on the street in front of a plain building with only two red and green lights outside to announce we had arrived at Smuggler’s Cove. This was by far the most mysterious of the bars we had visited over the last two nights, since word is that this very serious Rum Establishment was the preferred destination for those who could care less about the tiki craze, but prided themselves on having the most sophisticated of palettes in the whole Bay Area. 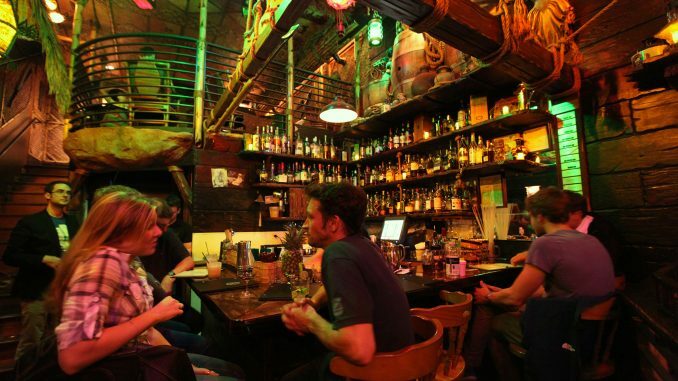 Since its opening in 2009, Smuggler’s Cove has been the locals pick for its menu of over 70 authentic cocktails; each with a story and an attention to detail that promises every one is made to perfection. 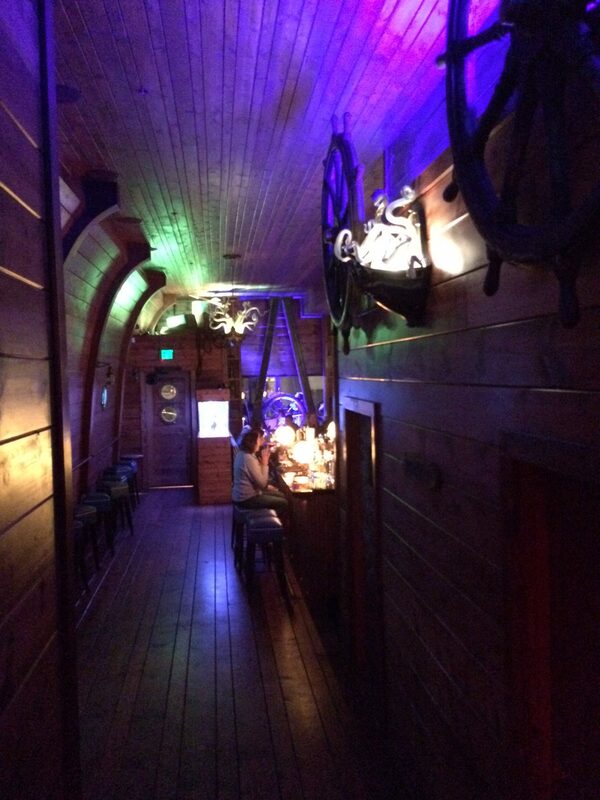 We entered and found ourselves in Pirate heaven; a slender three story high bar, we peered up at the nautical themed ceiling and were bedazzled by barrels, lanterns and ropes swaying ominously; on level with an upper mezzanine named The Hut with a purported capacity of only 20 people. From where we stood, we were on level with the main bar that maybe accommodated only 10, and then, taking a spiral staircase into the bowels, we discovered the boathouse, a dark, moss sided affair with another bar, jammed to the walls with maybe 20 more people; tops. 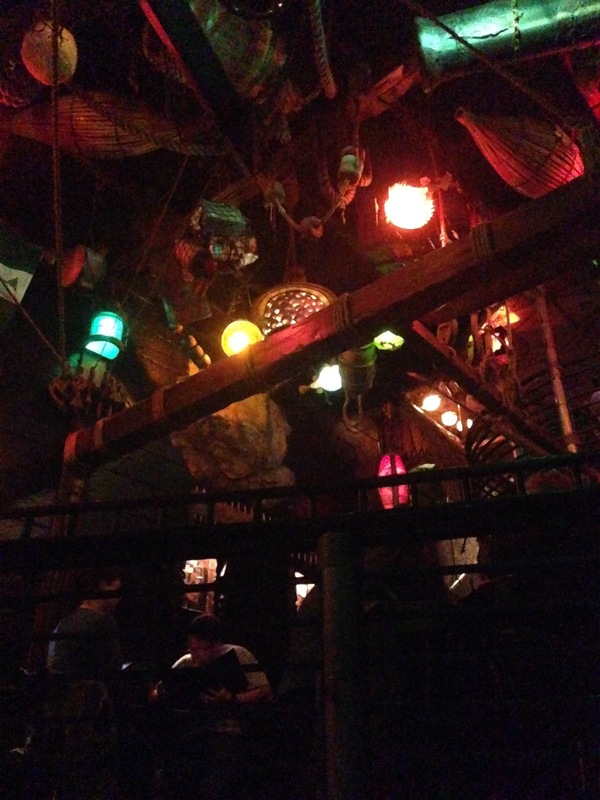 (Smuggler’s Cove only has a 49 person capacity). Along the trip down, we passed a subterranean waterfall that splashed against blue, red and gold lit cavernous ledges. We squeezed through the crowd to make it to the bar, where you could tell some serious mixology was going on. My wife hefted up a weighty tome that was the menu, and we marveled at page after page of drinks. We learned by reading through the bible by the light of our iPhones that Smugglers specializes in drinks from the Caribbean, classic libations of Prohibition-era Havana, and finally, of course, exotic tiki bar cocktails. They are, in their own words, the past, present and future of rum. I got as far as the Prohibition Era Havana drink menu and knew I had to try the Hotel Nacional Special, which was a simple mix of Pineapple, Rum, Apricot Liqueur and lime. One thing I did know, Cuban drinks are deceptively simple, offering up deep, rich flavors with only a modicum of ingredients. The wife ordered a Sidewinder’s Fang, which sported lime, orange and passion fruit juices with Dark Jamaican and Silver Reserve Rums. We stood awkwardly in the center of the room, when the wife again spied a tiny respite, a partial bench and ottoman for us to squeeze onto. It took a while to get our drinks, but Smuggler’s Cove prepares you for this throughout their website, reminding you there will a wait for your special sips of paradise. We quickly learned that the place is a haven for friendly folk. Some are in their 20s and 30s, but their was a great majority of serious drinkers in their 40s and 50s and beyond. I got into a fascinating conversation with a woman who was there with her friends and boyfriend, and once our drinks arrived and I had downed most of mine, I seemed to have no problem convincing her that after 7 years her boyfriend needed to commit. The wife, meanwhile, was in deep discussion with salesmen from out of town, one who would only give us the name Tiki Tony, and his much younger associate who went by Paradise Pete. They would only drink Painkillers. 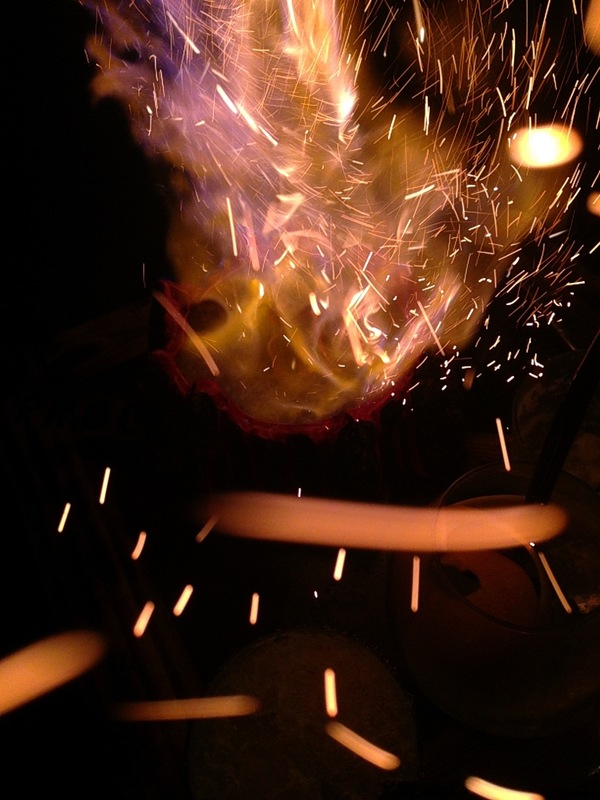 This was to be our undoing. 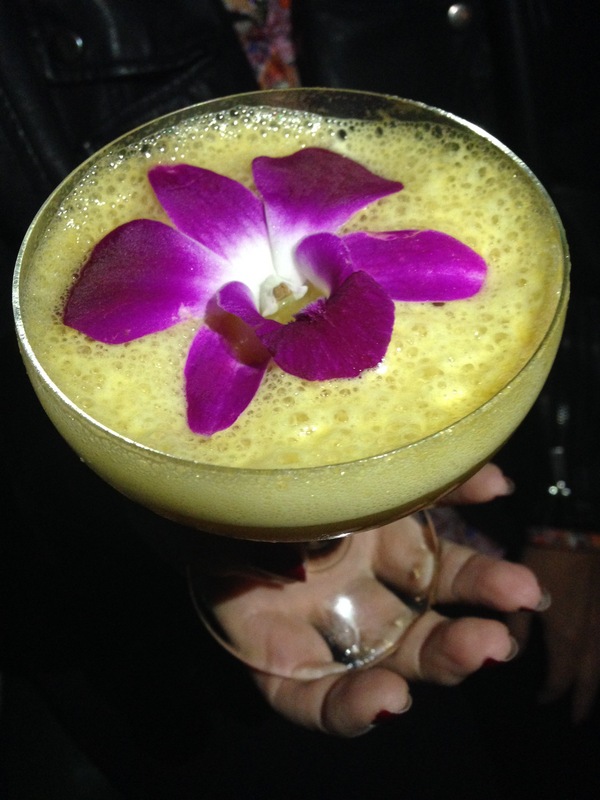 I was really enjoying my drink, when the bartender showed up with another in hand for me, apologizing profusely because instead of the Hotel Nacional, he had accidentally made me a Daisy de Santiago. Oof, my license as a serious libation connoisseur should be revoked, as I had no inkling. (I blamed it on the Absinthe in my previous drink) and happily accepted this freebie. The Daisy de Santiago was made up of rum, lime, sugar, seltzer, and yellow chartreuse and I am obviously a foolio for not noticing. This new incarnation, the Hotel Nacional Special, was not sweeter and actually, less satisfying than the faux Nacional I had started with. No matter, since Tiki Tony decided we all needed Painkillers. 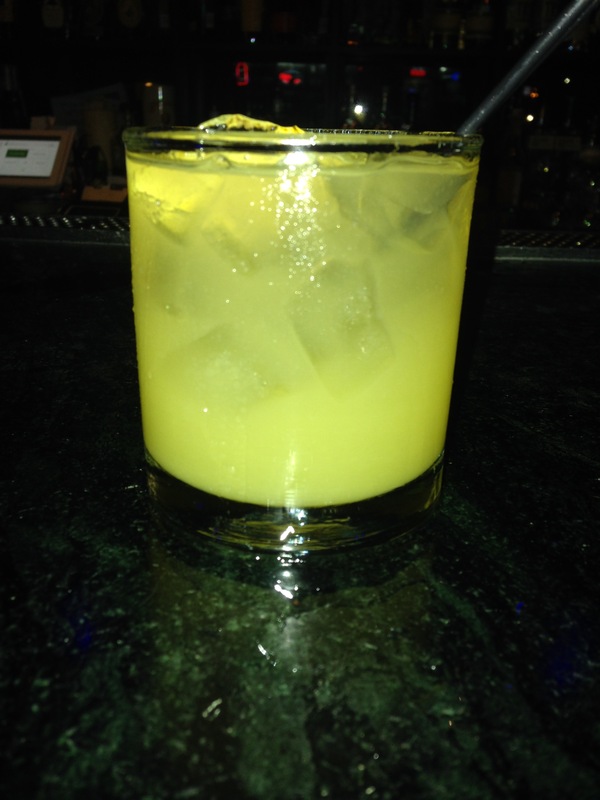 In fact, he specified Painkiller #2 which involves Pusser’s Navy Rum, orange, house made coconut cream, pineapple juice and nutmeg. Paradise Pete demands plenty of nutmeg in his. At this point, we met Jenny and Grace; two San Jose locals who were celebrating Grace’s birthday. By our third Painkiller, we had learned everything about one another, including that Jenny was a bartender herself, and Grace was manager of a restaurant. Tiki Tony had his eye on Jenny. Or was it Grace. Either way, a Top Notch Volcano showed up in honor of the birthday girl, and this was quite a show. Made for 4, this mountainous libation involves pineapple, lime, passion fruit, maraschino liqueur, Private reserve rum and a floor show. 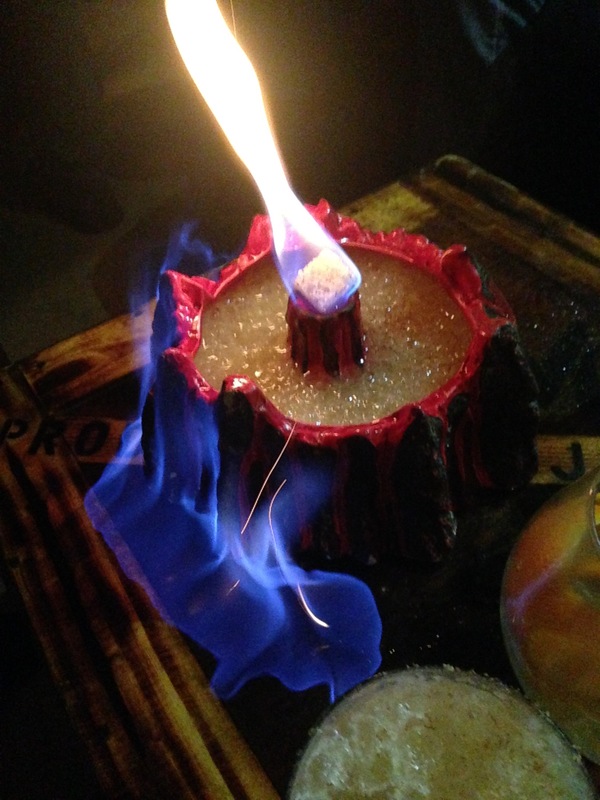 Lit on fire with a lava flow that burns right out of the volcano’s mouth and onto the table, it’s a feast for the eyes and tastebuds. The rest of the night was a blur. The girls (and a third friend) knew of a late night bar that had nothing to do with tiki but everything to do with “an insider’s track” (a bartender’s choice, as you will) and we were struggling into the doors of the Nitecap, a tiny little joint with a mastiff named Hubert bidding us hello. 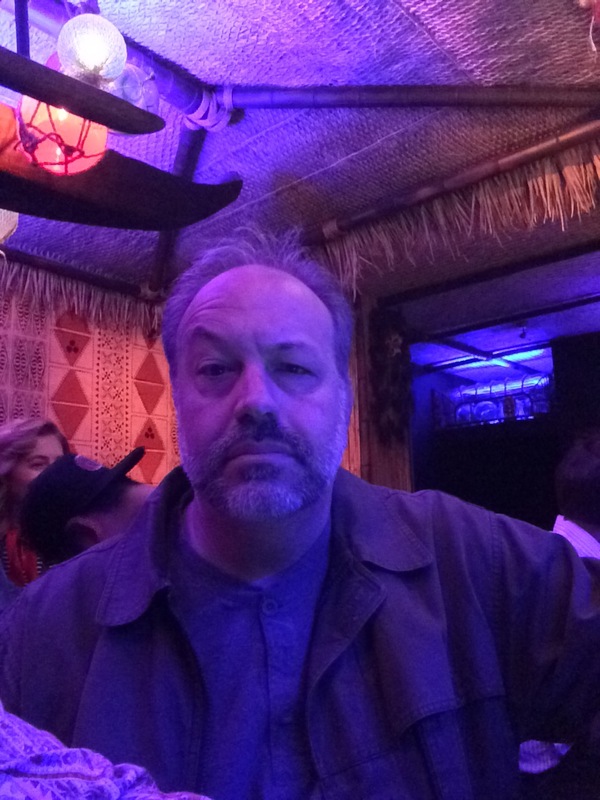 The five of us bellied up to the bar, and to keep it tiki, I ordered a Captain Morgan’s and pineapple juice, and heard many stories about our new compatriots. Why did I take a picture of this rum and pineapple juice? Only my blood alcohol content will tell. From there, food was a definite necessity and we found ourselves at all night diner, The Pinecrest, which had colorful locals and some delicious chocolate shakes. We were polite adults, as the wife and I dropped the ladies off at their hotel and somehow made it back to our mirrored room at the Clift by dawn’s early light. A two day, whirlwind adventure, our Tiki Crawl was officially over, but we had photos, memories, new friends and hangovers to last a lifetime. Viva La Bay Area! Mahalo!